The rest of the dead come forth in the second resurrection to receive their immortal physical bodies. Satan, the followers of Satan, and the sons of perdition are then cast off as spirits never to associate with the rest of mankind again. Then mortal man comes to an end and each inherits a glory in eternity (1 Cor. 15:40 ). Believers are only a few compared with all mankind. “13 Enter ye in at the strait gate: for wide is the gate, and broad is the way, that leadeth to destruction, and many there be which go in thereat: 14 Because strait is the gate, and narrow is the way, which leadeth unto life, and few there be that find it.” (Matt. 7) “I tell you that he will avenge them [believers who have died] speedily. Nevertheless when the Son of man cometh, shall he find faith on the earth?” (Luke 18:8) Jesus is not returning to Rome, London, or Austin; but to Jerusalem. He is returning to His elect: the seed of Abraham, Isaac, and Jacob. “37 Behold, I will gather them [ Israel ] out of all countries, whither I have driven them in mine anger, and in my fury, and in great wrath; and I will bring them again unto this place, and I will cause them to dwell safely: 38 And they shall be my people, and I will be their God.” (Jer. 32) Only a very small remnant of Gentiles is to remain to greet Jesus when He returns. This should cause all Christians to earnestly examine not only their own beliefs; but, the beliefs of all Christian faiths. Truth has no fear of investigation. What is this “straight gate”? “I am not ashamed of the gospel of Christ: for it is the power of God unto salvation to every one that believeth; to the Jew first, and also to the Greek.” ( Rom. 1:16) As believers were for-ordained before the foundation of the earth, this gate or gospel of Christ had to be part of God’s original plan for mankind. The same gospel that saved men in the days of Jesus and the Apostles saves men of all ages. If the law of God on salvation were to change, no man could have unwavering faith in God. “And the disciples were called Christians first in Antioch .” (Acts 11:26 ) Disciples of Christ have also been known as believers, the sons of God, and saints of God. Adam, Noah, Abraham, and Moses were all Christians; as they were truly disciples of Jesus. The Bible begins with a synopsis of events from the beginning to Moses—written by Moses. We have to use both the Old and the New Testament in an investigation concerning the truths of Christianity vs. the myths. Moses conversed with God face to face as a man converses with a friend (Ex. 33:11). Moses, though, wanted to see God in all His glory (Ex. 33:18). But, no man can look upon the face of God in all His glory and live. God placed him in a cleft of the rock, covered his face with His hand, and allowed Moses to see His back parts in all His glory (Ex. 33:22, 23). When God appeared to Ezekiel it was in the likeness of man (Ezek. 1:26 , 27). Jesus bore our sins in two ways. As the first man without sin, Satan held no power of death over Him; and the Father had to raise Him from the dead with an immortal physical body. He was then given all power over this creation by the Father; including the keys to our resurrection. Every mortal man will be freed from death [eternity as spirits] which is the wages of sin (Rom. 6:23 ) and receive an immortal physical body. Those who know God and Jesus and obey the gospel are given the next grace: forgiveness of sin and adoption into the kingdom of God . Those who endure faithful and obedient receive another grace: the first resurrection and life on earth during the Sabbath of Creation. The final grace brings an inheritance on the earth with God and Jesus for eternity. All of this we owe to the man who did no sin, who lived to help others, and who sacrificed His life for the life of all. Praise our Lord Jesus! “Seek ye first the kingdom of God, and his righteousness; and all these things shall be added unto you.” (Matt. 6:33) Every person born in the flesh is alien to the kingdom of God . Every kingdom (or country) has laws and officers to enforce those laws. The laws of God define the requirements to be disciples in His kingdom. The Bible makes these prerequisites so clear that “every creature” is capable of understanding them, if they open their mind like a little child. “Enter ye in at the strait gate.” (Matt. 7:13) What is this straight gate? It is the gospel of Christ. “For I am not ashamed of the gospel of Christ: for it is the power of God unto salvation to every one that believeth; to the Jew first, and also to the Greek.” ( Rom. 1:16) The Bible is clear in its explanation of the gospel. From cover to cover the Bible teaches of the necessity of the disciples being faithful and obedient. Those before the great flood turned to wickedness. All were destroyed; except for eight souls—the family of Noah. The cities of Sodom and Gomorrah turned to wickedness and only Lot , his wife, and two daughters escaped. The time of the Jews was fulfilled (ended) when they rejected the authority of Jesus and had Him crucified. Jesus told us, “And they [Jews] shall fall by the edge of the sword, and shall be led away captive into all nations: and Jerusalem shall be trodden down of the Gentiles, until the times of the Gentiles be fulfilled.” (Luke 21:24) This prophecy was fulfilled after the six day war in 1967. The gospel will now return to the house of Israel . We now live in the final years of the last generation that will see the great desolation. Biblical generations are forty years. It was exactly forty years from the time the Jews rejected Jesus to their almost total destruction under the Roman Army. Of all the people in Jerusalem 1.1 million were killed and 97 thousand taken captive (The Complete Works of Josephus, Wars of the Jews, Chapter IX). The Bible identifies only two priesthoods authorized by God. The Melchisedec Priesthood is the higher and once bestowed it is held for time and eternity (Heb. 7:3). It holds the power or keys to bring men through the gate into the kingdom of heaven. “And I will give unto thee the keys of the kingdom of heaven: and whatsoever thou shalt bind on earth shall be bound in heaven: and whatsoever thou shalt loose on earth shall be loosed in heaven.” (Matt. 16:19) It was first held by Adam and was passed through first born sons from Adam to Shem, the son of Noah. It was held by Abraham and by Melchisedec who was a most honorable High Priest. “For this Melchisedec, king of Salem , priest of the most high God, who met Abraham returning from the slaughter of the kings, and blessed him.” (Heb. 7:7) It was held by all the Prophets of God. It was lost during the Egyptian captivity and restored by Moses. It was lost again about 400 years before Jesus and restored through Him. The lower Levitical Priesthood holds divine authority to preach the gospel and baptize with water. Only the Melchisedec Priesthood holds authority from God to baptize with the Spirit, confirm men into the kingdom of God , and bestow upon them a gift of the Holy Ghost. Who baptized you, confirmed you into the kingdom of God , and bestowed upon you a gift of the Holy Ghost? Did he hold the Melchisedec Priesthood? It was requisite for Jesus to organize the church with all of the officers of the Melchisedec Priesthood. As long as one officer of this priesthood remains on the earth, the gate into the kingdom of God remains open. “11 And he gave some, apostles; and some, prophets; and some, evangelists [High Priests]; and some, pastors [Elders] and teachers; 12 For the perfecting of the saints, for the work of the ministry, for the edifying of the body of Christ: 13 Till we all come in the unity of the faith, and of the knowledge of the Son of God, unto a perfect man, unto the measure of the stature of the fulness of Christ.” (Eph. 4) Clearly, this priesthood is required “For the perfecting of the saints, for the work of the ministry.” No one would be bold enough to claim we have all “come in the unity of the faith.” Who would be bold enough to deny the Bible and declare these officers are not required to enter the kingdom of God ? Who, among the ministers of your church, make any claim to this priesthood? Jesus was ordained under the hands of the Father. He called and ordained the twelve Apostles. “And he ordained twelve, that they should be with him, and that he might send them forth to preach.” (Mark 3:14 ) The Apostle Paul wrote, “Whereunto I am ordained a preacher, and an apostle, (I speak the truth in Christ, and lie not;) a teacher of the Gentiles in faith and verity.” (1 Tim. 2:7) Paul ordained his son Timothy; and reminded him of his duties. “14 Neglect not the gift that is in thee, which was given thee by prophecy, with the laying on of the hands of the presbytery. 15 Meditate upon these things; give thyself wholly to them; that thy profiting may appear to all. 16 Take heed unto thyself, and unto the doctrine; continue in them: for in doing this thou shalt both save thyself, and them that hear thee.” (1 Tim. 4) The Apostles, in turn, ordained High Priests and Elders. “For every high priest taken from among men is ordained for men in things pertaining to God, that he may offer both gifts and sacrifices for sins.” (Heb. 5:1) “And when they had ordained them elders in every church, and had prayed with fasting, they commended them to the Lord, on whom they believed.” (Acts 14:23 ) No one was recognized among the disciples without a proper calling and ordination. “Beginning from the baptism of John, unto that same day that he was taken up from us, must one be ordained to be a witness with us of his resurrection.” (Acts 1:22 ) The noted historian Eusebius tells of the office of High Priest remaining for at least a generation after the Apostles (Eusebius’ Ecclesiastical History, Chapter 17). The Apostle John saw this coming apostasy and described the sequence of how it would happen. “3 So he carried me away in the spirit into the wilderness: and I saw a woman [church] sit upon a scarlet coloured beast, full of names of blasphemy, having seven heads and ten horns. 4 And the woman was arrayed in purple and scarlet colour, and decked with gold and precious stones and pearls, having a golden cup in her hand full of abominations and filthiness of her fornication: 5 And upon her forehead was a name written, MYSTERY, BABYLON THE GREAT, THE MOTHER OF HARLOTS AND ABOMINATIONS OF THE EARTH. …9 And here is the mind which hath wisdom. The seven heads are seven mountains, on which the woman [ church of Satan ] sitteth. 10 And there are seven kings: five are fallen [ Egypt , Assyria , Babylon , Persia , and Greece ], and one is [Pagan Rome], and the other is not yet come [Pagan Christian Rome under Constantine ]; and when he cometh, he must continue a short space [325 – 476 AD]. 11 And the beast that was, and is not, even he is the eighth [Papal Rome], and is of the seven, and goeth into perdition.” (Rev. 17) Only Rome has synonymously been known as the city of seven hills. The harlots could only be churches which adopted the mystery doctrines of their mother. In the early fourth century the Roman Emperor Constantine conquered Rome by the sword. He was one of the most brutal men in history. He murdered his father-in-law Maximian in 310. Then he killed his main rival, and brother-in-law, Maxentius in 312; and had his head carried through the city on a pike. He murdered his brother-in-law Bassianus in 314, his nephew Lincinianus, a boy of only 13, in 319, his wife Fausta in 320, his brother-in-law Licinius in 324, his own son Crispius in 326, and some hundred thousand dissenters. After a bloodbath in Constantinople , only two sons remained alive out of his whole household. It seems he was struck by the horror of his own sword. He went to Sopater, a pagan priest and philosopher, seeking forgiveness for his atrocities. After being told there was no kind of purification that could forgive such enormities, he went to the Christian bishops. After several hundred years without instruction from God and being persecuted by Rome , Christianity slipped back into many of the Gentile pagan beliefs and desperately sought relief from Roman persecution. The Bishops told Constantine that he could be forgiven of all sin through baptism. These bishops, in their quest for relief and power, offered the impossible. There is no forgiveness in this life for a murderer; as King David discovered (2 Sam. 11:15 ; Acts 2:29 ). Constantine then murdered Sopater, who had refused him absolution. In 325 AD, he called the Council of Nicaea at the royal palace, stood as its absolute head, and took an active part in the discussions. About 250 bishops, almost entirely from the Eastern Church, joined in the council. After weeks of bickering over the identity of God and Jesus, St. Athanasius compiled a new creed that satisfied Constantine , defining the Christian God the same as the pagan Trinitarian sun god only with Christian names. He established heresy as a political crime and made the cross the saving event rather than the crucifixion. It is easy to understand why Catholics still adorn the cross. Anyone who tried to hold to original doctrines were labeled heretics by Constantine —an offense punishable by death. The sword established the new doctrine and after centuries of tradition who was to know the better? The effect of Constantine ’s conversion of Christianity to paganism was profound. Constantine assured Christians would violate the first of the Ten Commandments. During the first Christian council, in 325 AD, he made the Trinitarian sun god the new god for Christians. The doctrine of the Trinity was embraced by all the mystic religions. It began with Nimrod, King of Babylon and a wicked grandson of Noah. There is absolutely nothing in the Bible to support this pagan doctrine. Ambrose, a Christian bishop contemporary with Constantine , wrote in The Confessions, “when God is thought of, our thoughts should dwell on no material reality whatsoever.” I will grant Constantine the fact that the Trinity is incomprehensible. Not so the Biblical God. The whole Bible is a story of God’s direct association with man. God conversed with Adam as a familiar friend (Gen. 2:3). He walked with Enoch (Gen. 5:24). He spoke with Noah (Gen. 6:14-21). He dined with Abraham who at first mistook him for a man; and invited Him into the tent to eat (Gen. 18). He wrestled with Jacob (Gen. 32:30). He conversed with Moses face to face (Ex. 33:11; Deut. 5:4). Which god is incomprehensible, the Father, the Son, or the Holy Ghost? “2 Hath in these last days spoken unto us by his Son, whom he hath appointed heir of all things, by whom also he made the worlds; 3 Who being the brightness of his glory, and the express image of his person, and upholding all things by the word of his power, when he had by himself purged our sins, sat down on the right hand of the Majesty on high.” (Heb. 1) Or, is it the Trinity itself which is the mystery—Mystery, Babylon the Great? Pagan Christian Rome fell in 476 AD. Papal Rome rose in 570 AD. This second beast had “two horns like a lamb;” but spoke “as a dragon.” John perfectly described Papal Rome. She was a church “like a lamb,” who exerted two worldly powers (two horns, religious and civil), and “spake as a dragon.” She was the third form of Rome . Through the power of Rome , she ruled over all religious and civil affairs. All people within her borders either worshipped Papal Rome or died. It has been estimated the Papacy has been responsible for the martyrdom of 50,000,000 people. The saddest event during the reign of the beasts was the end of the kingdom of God . Pagan Rome disposed of the Church of Christ and divine authority (Rev. 12:6, 17). Pagan Christian Rome removed the doctrines of the gospel and replaced them with paganism. She was the first beast to commit blasphemy (13:5). Spiritual destruction came by removing the foundation by which salvation is made possible. Constantine changed the nature and character of God and Jesus, removed all divine authority by which men can enter the kingdom of God , changed the Sabbath, and altered the gospel. Baptism, which means immersion, was reserved for the penitent. It was changed to sprinkling innocent little children. “But Jesus said, Suffer little children, and forbid them not, to come unto me: for of such is the kingdom of heaven.” (Matt. 19:14) “He that believeth and is baptized shall be saved; but he that believeth not shall be damned.” (Mark 16:16 ) After the Bible was translated into English and Luther successfully stood against the pope, many realized they had never been baptized; and organizations like the Anabaptists, in 1521, immediately had people baptized even though they held no divine authority. Only Rome is synonymously known as the city of seven hills (Rev. 17:9). Only Rome declared war on the Church of Christ , God, Jesus, divine authority, the Sabbath, and the gospel. Through Papal Rome Satan received power over all the souls of man. Rome has changed the laws of God; and her leaders have stood as God on earth. Only Constantine and the Popes “opposeth and exalteth himself above all that is called God, or that is worshipped; so that he as God sitteth in the temple of God , shewing himself that he is God.” (2 Thess. 2:4) “The power of the pope is greater than all created power, extending itself to things celestial, terrestrial and infernal, and that the pope doeth whatsoever he listeth even things unlawful, and is MORE THAN GOD.” (Dissertation on the Prophecies, Rev. G. S. Faber, Vol. 1, pp. 203, 204) You can read when harlots sat as popes, the depths of papal degradation, and the evils that became identified with Rome in Halley’s Bible Handbook, Church History. The early church consisted of scattered branches that met together wherever they were able. Elders presided over these various branches (Acts 14:23 ). There was no head of the church. Constantine organized the Catholic Church in 325 AD; and was first to stand as its absolute head—as God on earth. Rome fell in 476 AD. The first Bishop that claimed to stand over the whole church was in 570 AD. “In 568 the Lombard invasion began, and in three years intercepted all communication between Rome and the Exarchate, by which the popes became sole masters of Rome and acquired all the civil and military power, as well as spiritual authority in the city, A. D. 570.” (Prophetic History, Rev. William War, a distinguished divine of the Church of England, Vol. 5, p. 240) The Catholic claim to divine authority is a myth. On October 21, 1517 , Luther posted “The 95 Theses;” which was primarily a rebellion against indulgences; but whose essence rebelled against the authority of the popes. Luther was excommunicated from the Catholic Church in 1520. Where others had been murdered for their rebellion, Luther had too many friends among the German Princes to be martyred. By 1540 all of Northern Germany had become Lutheran. The Pope declared a war against them that lasted from 1546 to 1555, ending with the Peace of Augsburg. Luther had successfully stood against the pope and the term “Protestant” began. Martin Luther would have us believe the gospel is in word and belief alone. We have already learned in the first part, Christianity Biblical Truths, that salvation in the kingdom of God requires more than just belief. Without a correct understanding of God and Jesus it is impossible to have faith in them. Constantine adopted the pagan Trinity in place of God and Jesus. Jesus and the Apostles taught us that even the devils believe; but, without obedience to the gospel none can enter the kingdom and be saved. They also taught that without the Melchisedec Priesthood none can enter the kingdom of God . We learned the true gate into the kingdom includes: (1) Faith, (2) subjecting our will to the will of God, (3) Repentance, (4) baptism of water, (5) baptism of the Spirit, (6) revelation and divine authority, (7) partaking of the Eucharist, and (8) remaining faithful and obedient to the end of mortal life. Second, this book was written “to the saints which are at Ephesus , and to the faithful in Christ Jesus.” (Eph. 1:1) This was not written to sinners; but, to those who had already obeyed the gospel and were members of the kingdom of heaven. Third, it is true that we are saved by grace; but, the grace that leads to salvation comes only through obedience to the gospel. “Jesus answered and said unto him, Verily, verily, I say unto thee, Except a man be born again, he cannot see the kingdom of God .” (John 3:3) What was Jesus referring to? Jesus explained to Nicodemus that He was referring to being baptized of water and being born or baptized of the Spirit. As these ordinances are only recognized by God through the administration of one holding the Melchisedec Priesthood [chapter 2], the doctrine is revealed to be a myth. The Bible provides us a way to know these false prophets (preachers). The Protestant, King James, version clearly identifies the Catholic Church as Mystery, Babylon . “4 And the woman [church of Satan] was arrayed in purple and scarlet colour, and decked with gold and precious stones and pearls, having a golden cup in her hand full of abominations and filthiness of her fornication: 5 And upon her forehead was a name written, MYSTERY, BABYLON THE GREAT, THE MOTHER OF HARLOTS AND ABOMINATIONS OF THE EARTH.” (Rev. 17, underlining mine) Given the Catholic Church as the mother, the harlots can only be those churches whose doctrines on God originated with the Catholic Church—beginning with Martin Luther and including all who worship the god of Rome and think to minister in the gospel without the power of the gospel—the Melchisedec Priesthood. It follows that at the end of the 1,260 years the word and power of the gospel and the Church of Christ would be restored to the earth. Moses and Jesus both restored the Melchisedec Priesthood in their day. “And I saw another angel fly in the midst of heaven, having the everlasting gospel to preach unto them that dwell on the earth, and to every nation, and kindred, and tongue, and people.” (Rev. 14:6) Exactly 1,260 years after the first pope sat in Rome in 570 AD, Joseph Smith organized the Church of Christ according to the laws of the United States on April 6, 1830 . It was latter renamed the Church of Jesus Christ of Latter Day Saints, commonly called Mormons. The mobs of Missouri followed them. 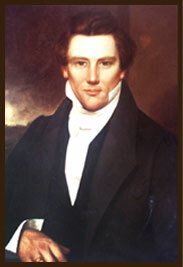 They had Joseph Smith arrested on false charges; but, true or false that had to be answered in court. The Governor of Illinois placed Joseph under protective custody. Then on June 27, 1844 , the state militia retreated, the mobs from Missouri moved in, and Joseph Smith and his brother Hyrum were murdered. The same hour that Joseph was martyred in Carthage , Illinois , James J. Strang, some 400 miles away in Burlington , Wisconsin , claimed to have been ordained under the hands of angels the same as Joseph and to the same Prophetic Office as his successor. Only one person on the earth can hold this highest office at the same time. James telling of his ordination was a prophecy that Joseph was dead. “The Almighty came from his throne of rest. …The sweetest strains of heavenly music thrilled in my ear, but the notes were low and sad as though they sounded the requiem of martyred Prophets. …And now behold my servant James J. Strang hath come to thee from far for truth when he knew it not, and hath not rejected it, but had faith in thee, the Shepherd and Stone of Israel, and to him shall the gathering of the people be, for he shall plant a stake of Zion in Wisconsin . …So spake the Almighty God of heaven. They duty is made plain, and if thou lackest wisdom, ask of God, in whose hands I trust thee, and he shall give thee unsparingly; for if evil befall me, thou shalt lead the flock to pleasant pastures.” James remains the only person to claim both an appointment by Joseph and an ordination in accordance with the law of God. James J. Strang spent nearly two years laboring with Brigham Young requesting him to take his proper place in the true restored church. Finally, Brigham and the Apostles who followed him were notified on January 13, 1846 , to appear before a High Council (a spiritual Supreme Court) by April 1. He refused. On April 6, 1846 , the High Council met to hear the case of Brigham Young and his followers. The council ruled to excommunicate them and remove all of their priesthood. That same year Brigham and his followers were driven out of Nauvoo. The Brighamites continue to honor “the venerable day of the sun” established by Constantine . As the Sabbath is a sign between God and His people (Ex. 31:16, 17), they have no claim to being the people of God. There is no doubt the Brighamite church, with headquarters in Salt Lake City , does a lot of good work. The same can be said for almost every other major church. God revealed to James J. Strang that the gathering of the people was moved to Beaver Island and the islands of northern Lake Michigan . Like the mobsters on the frontier in Missouri , the people on the mainland made every attempt to kill and drive the saints from their homes. James was a firm believer that whiskey should not be sold to the Indians; and would not allow it on Beaver Island . This was a major source of income for those in Mackinac. On June 16, 1856 , with the help of the captain of the U. S. Steamer Michigan, James was mortally shot. The latter day saints were driven from their homes and their property stolen. James was taken back to Voree where he died on July 9th. He did not appoint a successor. The twelve Apostles understood they held no authority in America to stand at the head of the church. The Church of Christ dissolved even as it did after John the Revelator. All was not lost. Every officer of the Melchisedec Priesthood holds authority to preach the gospel and administer its saving ordinances. 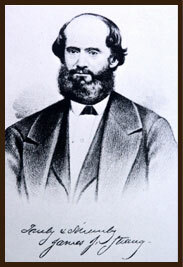 James ordained L. D. Hickey one of the twelve Apostles. He ordained Samuel Martin a High Priest, who ordained Lloyd Flanders a High Priest, who ordained Samuel E. West an Elder. In recent years he has ordained other Elders; and a major gospel work began in Africa in April, 2005, in preparation for the return of our Savior. Within a year the gospel was accepted in Kenya , Uganda , Botswana , and Djibouti . In the first year alone there were over 600 converts and a Children’s Home for orphans and disadvantaged children. The power of the gospel remains.